If you need an easy-to-use, single-sided, hand-fed ID card printer that’s both compact and affordable, the Magicard Pronto Single-Sided ID Card Printer prints high-quality IDs with vibrant colors and crystal clear text. The Magicard Pronto also prints a unique watermark for identification and security purposes at no additional cost. Lightweight, yet sturdy, the Magicard Pronto Single-Sided ID Card Printer is easily transported from reception desk to office or from location to location. Perfect for events or use in the field, the Magicard Pronto Printer goes where you need it most. Included with the Magicard Pronto Single-Sided ID Card Printer is the advanced HoloKote, a patented technology that prints a secure watermark during processing. You can choose from 4 standard watermarks to customize your badges for visual security purposes. You get a versatile, single-sided printer that anyone can use. Simply power it up, easily install the driver, drop in the dye film, and start printing. The Magicard Pronto Single-Sided ID Card Printer prints both full color cards or thermally activated cards that can be printed, erased, and rewritten in monochrome. 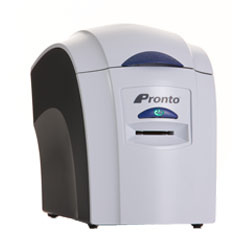 The Magicard Pronto Single-Sided ID Card Printer is covered by a 2-year warranty.